Sorry in advance for my posts this week, I can tell already it will be a miss-mosh of randomness since I have a gazillion deadlines to tackle and don’t have much time to dedicate to my own blog. This past weekend I had the pleasure of second shooting for the lovely Maria Mack, who I joined at Citizens Bank Park to photograph a stunning, ballpark wedding. Thank goodness the weather behaved itself and we had nothing but sunny skies. 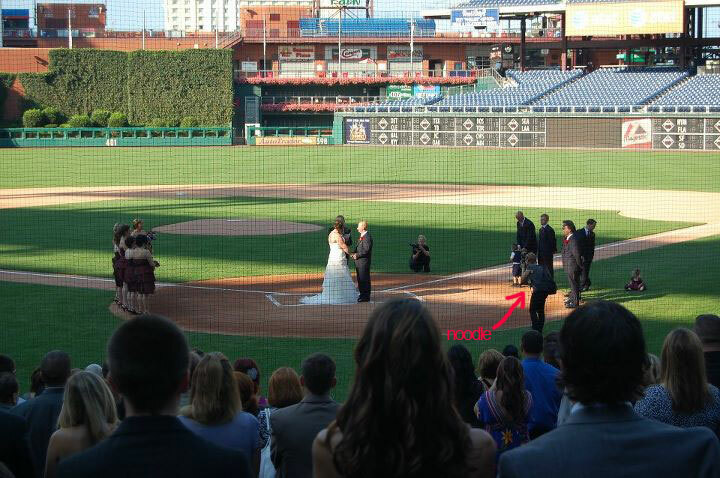 I thought it was cute how the guests were able to sit in the stands while the ceremony was held on the field. The reception took place at the Diamond Club and the Phillie Phanatic even came to bust out some fabulous dance moves. I think my favorite shot from the night was when the Phanatic got together with three pregnant women and posed while sticking his pregnant-esque belly out. I also toured around the players’ locker room with the groom, which was an absolute blast. I may or may not have flailed like an idiot when I saw Cliff Lee’s locker. We were able to sneak a peek at all of their grooming essentials, which was highly entertaining. I may or may not have found out from a little bird that the boys have their fair share of brightly-colored loofahs in the showers. 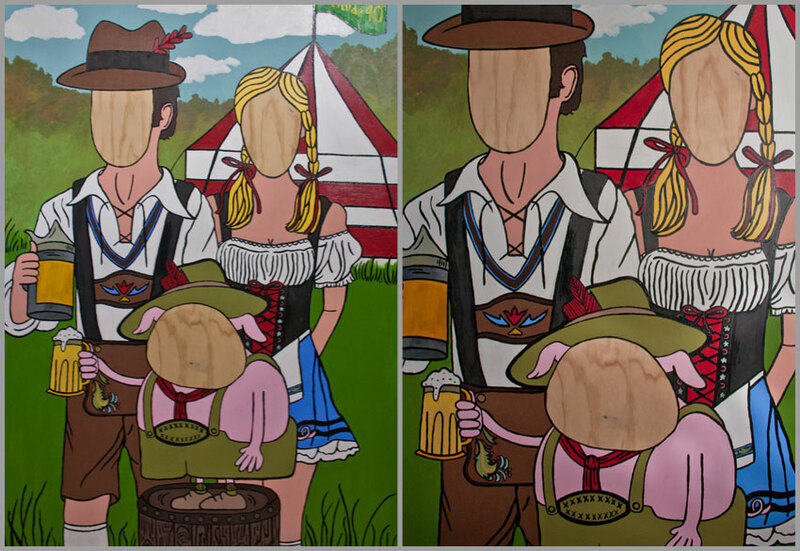 In other news, a large portion of my week is going to be dedicated to tackling this life-sized painting of a German couple and a drunk pig sporting Lederhosen. 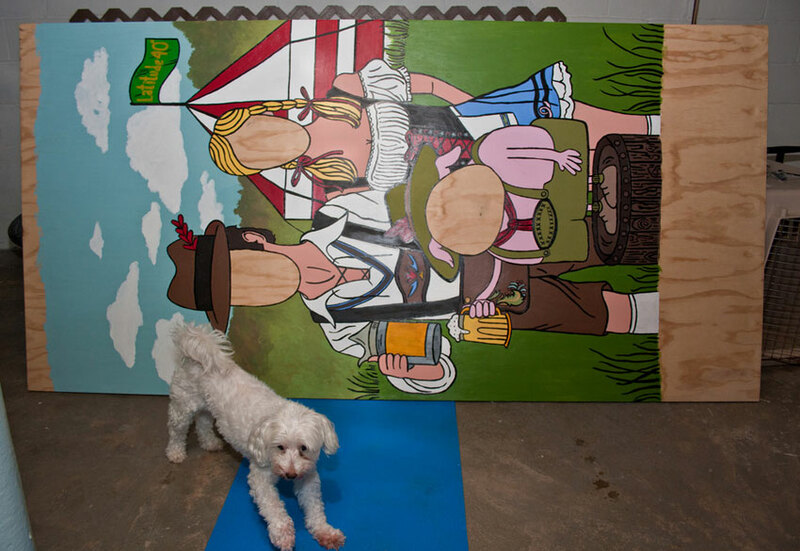 Pete’s brother is co-hosting an Oktoberfest bash this weekend, so once the painting is complete, he’s going to cut out face holes for a fun photo-op. 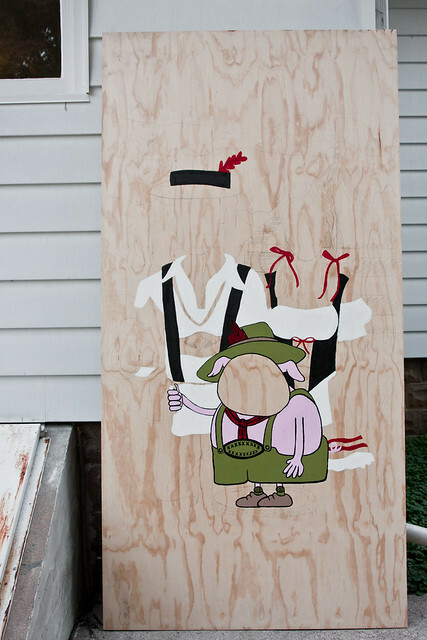 I’m hoping to finish this up mid-day on Wednesday, so I’ll be sure to post another shot once it’s finished! It looks a bit wacky now, but I like showing progress shots of big projects, which you may or may not have figured out by now. Posted on September 12, 2011 Categories art, everyday life, happenings, philadelphia, weddingsTags Citizens Bank Park, Oktoberfest, photo-op, wedding1 Comment on Weekend Happenings!